A call box is a (usually metal) box containing a special- purpose direct line telephone or other telecommunications device, which has been used by various industries and institutions as a way for employees or clients at a remote location to contact a central dispatch office. Call boxes may be wired or not. Wireless systems use radio frequencies in the VHF or UHF business band radio spectrum. 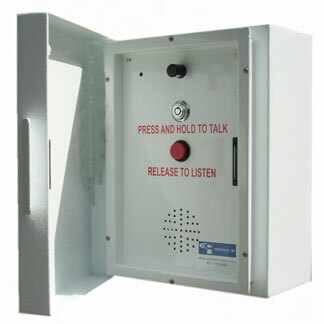 Many callboxes can be programmed to be compatible with virtually any brand of VHF or UHF business band portable or fixed-base radio. Many in the United States require an FCC license, but some are certified for use on special FCC license-free business frequencies.